A scoop of frozen confection this rich is almost a meal in itself. : It's hard to select just one scoop at Lappert's Ice Cream, but you can ask for a taste if you're undecided. The ice cream is rich but light, and packed with local ingredients such as coconut, macadamia nuts, papaya, mango and more. Buy it by the dish or in a waffle cone. Coffee is also served, to heighten the buzz. This is premium ice cream, and it comes at a premium price, making it a costly treat for a family. 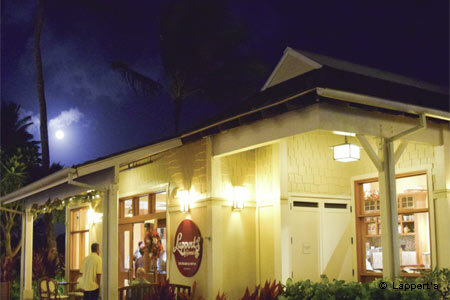 Founded in 1983 by the late Walter Lappert, a Kauai resident, it remains a local favorite.